Carnival Cruise Line has announced the next new cruise ship named Carnival Panorama which will join the fleet in 2019 will feature the first-ever indoor trampoline park and challenge zone at sea. The Carnival cruise ship which is currently under construction in Italy will feature the first-ever indoor trampoline park and challenge zone at sea, in partnership with industry leader, Sky Zone. This will be a new 3,000 square foot expansive two-deck facility located on deck 6 and 7. There will be a 12-lane trampoline court. The IMAX Theater which is features on sister ships Carnival Vista and Carnival Horizon will make way for the new space on Carnival Panorama. Next to the Trampoline Park will be the Challenge Zone featuring a climbing wall, balance/jousting beam, Sky Ladder climbing apparatus and Tug of War. The entire Sky Zone space will be used for a variety of activities for all ages cruisers including gravity-defying dodgeball games, nighttime blacklight glow parties, and toddler time sessions with oversized soft blocks and bouncy fun. Fitness will take center stage too at Sky Zone with events and classes to make sure that amazing Carnival food is worked off. The cruise line will be announcing further details about the Sky Zone in the future. Sky Zone is an industry leader at bringing these type spaces to the world. They already have over 200 parks across the United States, Canada, Mexico, Guatemala, Australia, the United Kingdom, Norway, India, Pakistan, Saudi Arabia, Kuwait, and Columbia. 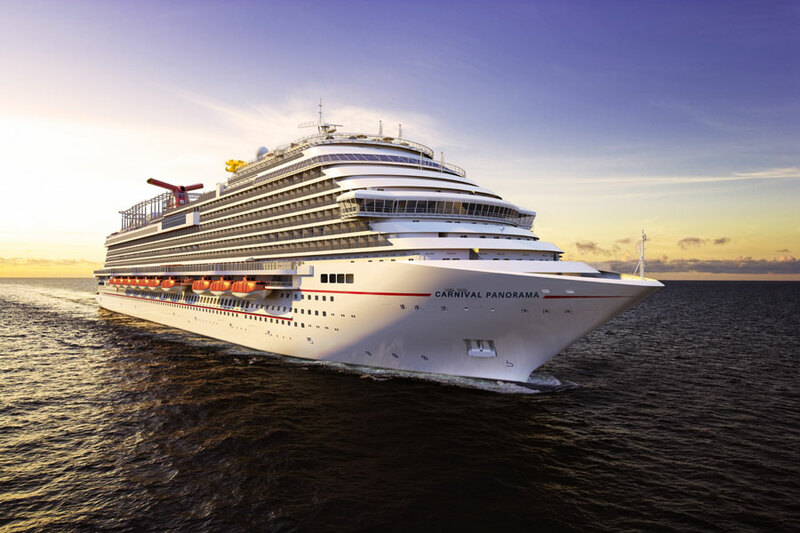 Carnival Panorama is currently being constructed by Italian shipbuilder Fincantieri in Italy. Once completed she will look almost identical to the Vista-class and be 133,500 gross tons. The new Carnival cruise ship will be based on the U.S. west coast out of Long Beach, California. The vessel will debut on December 11, 2019, with a 3-day inaugural cruise. Mexican Riviera cruises from the U.S. west coast will begin on December 14, 2019.